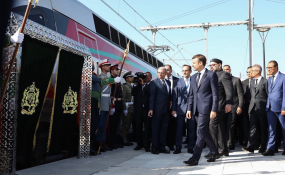 Tangier — French President Emmanuel Macron arrived Thursday afternoon in Tangier for a working visit to the Kingdom of Morocco, on the occasion of the inauguration of the Tangier-Casablanca high-speed train line. At the entrance of the Royal Lounge of Tangier's Ibn Batouta airport, President Macron was welcomed by HM King Mohammed VI. The two heads of state then had tête-à-tête talks. Upon his arrival at the airport, the French President was greeted by Head of Government, Saad Eddine El Othmani, before reviewing a detachment that paid the honors. President Macron was then greeted by HM the King's advisors, Fouad Ali El Himma and André Azoulay, Minister of the Interior, Abdelouafi Laftit, Minister of Foreign Affairs and International Cooperation, Nasser Bourita, and Minister of Economy and Finance, Mohamed Benchaaboun. The French President's visit to Morocco reflects the depth of bilateral relations, which are rooted in a strong partnership, thanks to the common will to strengthen the multidimensional ties binding the two countries.